I sure got into the Christmas spirit over the last week while writing articles for two of my favorite Italy websites: Dream of Italy for a general overview of the holiday season in Umbria and About.com’s GoItaly for some specific suggestions for not-to-be-missed sights and events if you are celebrating Christmas in Umbria. Over the past thirteen—gulp! That can’t be right!—years welcoming guests at Brigolante, I have come to realize that about 95% of their queries are repeat questions. Some of these I have template emails for (i.e. Do you have driving directions to reach you? ), some of these I have pages in our welcome packet for (i.e. How does the washing machine work? ), some of these I have Slowtalk for (i.e. What is the best credit card to use when travelling? ), some of these I have local friends for (i.e. Where does one buy an accordian, anyway?). And some of these I am gradually trying to answer here on my blog, which is why there is a drily-yet-concisely-entitled category called Trip Planning Tips for Umbria. Among the most common travel advice guests require is help in planning an itinerary for Umbria, which is also one of my favorite questions to answer. Here is a two week long suggested itinerary for visiting Umbria which throws in the crème della crème of the region: art and history, towns and parks, food and drink, people and shopping. It may not suit everyone, but feel free to use it as a guideline for planning your trip. Two weeks is the minimum amount of time you will need to properly visit Umbria, but I recognize that travellers have minor inconveniences like Jobs and Families which restrict their holiday time. If you are only here for a week, check for a seven day itinerary here. I am writing primarily for my guests, so I presume your base is Brigolante or, at very least, Assisi. If you are staying in another town in Umbria, you will have to make some adaptations. You’ve had two towny days, it’s time to see the other side of Italy’s Green Heart: her lovely parks. Umbria has seven regional parks and one national park…a surprising number for one of the smallest regions in Italy. You’ve already visited one of the regional parks…in fact, you’re sleeping in one as Brigolante is within the borders of the Mount Subasio Park (as is the entire town of Assisi). Today I suggest you go further afield and visit one of the other parks in the region: the Sibilline National Park with its breathtaking Piano Grande plateau. There are a couple of hiking trails of varying difficulty—make sure you take a good map—or you can simply take a scenic drive along the spectacular winding road through the plateau, which is bloom from May to July but gorgeous all year round. I also suggest you work in a visit to delightful Norcia (don’t waste your time with Castelluccio, which is much prettier from afar), a pretty town known as a foodie mecca for its tradition of truffles and charcuterie. Ristorante Beccofino in Piazza San Benedetto is a perennial favorite for lunch or dinner. Umbria’s provincial capital may seem daunting, with its modern suburbs surrounding the historic center, but don’t be put off. Find your way to the Piazza Partigiani parking lot and take the series of escalators passing through the underground ruins of the medieval alley of the city, which now form the foundations of the modern city above. Have a good guide on hand; Perugia is full of interesting churches, monuments, and museums. My favorites are the Galleria Nazionale dell’Umbria and San Francesco al Prato. After lunch and a post-prandial stroll (and a caffè and pastry at Pasticceria Sandri on the Corso), take the afternoon to discover Umbria’s amazing array of artists and artisans who, for centuries, have produced some of the highest quality wares in Italy and the world. Many, including my two favorites Laboratorio Giuditta Brozzetti, which hand-looms traditional Umbrian fabric and Laboratorio Moretti-Caselli, which paints stained glass, are workshop-museums where five generations of artists have occupied the same artelier. Others, listed here, offer visits to their workshops. There is no better way to return home with both a unique souvenir from Umbria, and an understanding of the region’s rich artisan culture and history. I can’t possibly send you home without having seen Orvieto’s cathedral. It is, simply put, one of the most stunning churches in Italy. You will be tempted to stop in Todi first, as it’s just off the highway, but push on to Orvieto passing along the banks of tranquil Lake Corbara. Once there, first book your time for the Orvieto Underground tour in the Piazza del Duomo’s tourist office, then backtrack to visit the sumptuous Duomo. Explore Orvieto under- and above ground, don’t miss the curiosity of San Pietro’s well, and make sure you have some excellent local white wine with your lunch. Afterwards, head back to Todi and spend the afternoon in the small but surprisingly cosmopolitan center of this friendly hill town. Take in the fabulous view over the surrounding rolling hills from the small public park along Via Ciuffelli and the quirky contemporary art boutiques in the center. Have dinner here, because it’s an easy highway drive back to Assisi. One of my favorite towns in Umbria is Spello, which has much of the charm of Assisi with about 1/100th of the tourists Yesterday you had a pretty long day that involved a bit of driving, so today you only need to be in the car for about 20 minutes. Spello is the next town over from Assisi along the S75 highway, though I suggest you take the old frontage road, which passes in front of Villa Fidelia—the Italian garden is worth a quick peek—and the much more interesting 11th century San Claudio church, whose delightfully off-kilter facade and elegant Romanesque interior has made it one of my off-the-beaten-track favorites (though you have to be damned lucky to catch it open to visitors). Once in Spello, don’t miss the Pinturicchio frescoes in the Cappella Baglioni and the impressive Roman Porta Venere. If you’ve been holding out to have a special meal, today is the day. La Bastiglia, a four star hotel with an equally wonderful restaurant at the top of town, is one of the best restaurants in Umbria. If the weather is nice, you can book an outdoor table overlooking the olive grove covered hills, or eat inside in the elegantly rustic (or is it rustically elegant?) dining room. A meal to remember. Otherwise, Spello is peppered with casual, friendly wine bars (my favorite: the unfortunately named Drinking Wine) where you can have a light meal and wonderful vino. Even God himself kicked back once a week, and (if I may remind you) you are on vacation, after all. So after a week of high powered touring, take it down a notch for today. Catch up on your laundry, hang out in the garden and power your way through one of those books you packed, grab our maps and hiking information and take a walk through the countryside around Brigolante (you can pick up the famous Franciscan trail virtually from our front door, or simply follow the road uphill past vineyards, olive groves, and pastures until you get to Costa di Trex at the top). Slow down and enjoy the passage of time. After all, as the great James Taylor once said, that is the secret of life. You’ve been landlocked for over a week now, so now it’s time to head to water. You’re back on the road again, but don’t panic because Lake Trasimeno is an easy 45 minute highway drive. Castiglione del Lago is a lovely town to visit, and from there you can take the regular ferries to Isola Polvese or Isola Maggiore in the middle of the lake. Trasimeno is a mud-bottomed lake and—frankly–not one of my favorite places to swim, but there are certainly pretty sandy beaches near Tuoro and Passignano if you want to stretch out and enjoy the view (notice how the countryside has become more gently rolling as you near the Tuscan border). One of my favorite spots for dinner in Umbria is Rosso di Sera in San Feliciano, where you can enjoy the beautiful sunset over the lake. One of my favorite places in Umbria to have a quiet drink is the Bar Tric Trac in Piazza del Duomo…if you manage to get there when the sun is setting and the swallows are circling the Duomo’s stately belltower, you are in for a golden Umbrian moment. Austere Spoleto was saved from centuries of provincial backwaterism by the world reknowned fine arts festival Due Mondi, and now is center to a thriving cultural scene. Don’t miss walking across the dizzying medieval Ponte dei Torri acqueduct which spans the Tessino ravine more than 80 meters below. As the wind makes the grass in the meadows below move like waves in a green ocean, stand near the edge, spread your arms, and understand for just a moment what it must feel like to take flight. (But not too near the edge…this towering structure is one of the top destinations for spurned lovers who have decided to meet their maker.) On your way home, take a minute to stop at the delightful Fonte del Clitunno and nearby Roman Tempietto. I have often waxed lyrical about the Valnerina, because this dramatic corner of Umbria inspires waxing. Today you will explore the Nera River Regional Park, winding your way along highway SS209 which skirts the Nera river and runs under steep mountainsides where tiny hamlets perch precariously. Stop by the beautiful Marmore waterfalls and the gorgeous San Pietro in Valle abbey (check their quirky opening hours carefully)…two of the best kept secrets in Umbria. Visit some of the creche-like villages along the river valley: Arrone, Vallo di Nera, Scheggino, Sant’Anatolia di Narco, Cerreto di Spoleto. You won’t be so much scratching your head as to why these towns are so empty, but more likely surprised that these miniscule, remote centers are still inhabited at all. If you are drawn to the truly strange and wonderful, visit Ferentillo’s mummies or Castel San Felice’s 12th century San Felice in Narco church, where the facade is decorated with a bass relief of the Saint ridding the locals of a troublesome dragon. We call it an allegory today, but if you visit the Valnerina on one of her more brooding, misty days the presence of a dragon doesn’t seem so farfetched. I know, I know. I keep harping on the People thing, but I know of what I speak. I can’t encourage you enough to take the time to really under the skin of Umbria with a knowledgeable instructor or guide. If there was something that caught your eye from Day Five (the most common combination with my guests is a wine tour one day and a cooking class another day—we must really attract foodies here), go ahead and consult that list again. Otherwise, there are some wonderful area guides who offer itineraries that would be hard to reproduce without their insider expertise. I especially like American Elizabeth Wholey’s Artisan Tour, Anne Robichaud’s (another American) FestaTours, and native Umbrian Alessandra Pettinelli’s Underground Tour. You won’t regret it. Again. Okay, I was kind of stuck on Friday because it’s the last guaranteed day of daytripping (some of you won’t be able to squeeze in your last visit somewhere on Saturday because your spouse pounced on cheap airline tickets while late-night online surfing nine months ago and didn’t notice until it was too late that it involved being at the Rome airport at 4 am tomorrow) and there are still about 50 wonderful things to visit. See caveats. But I couldn’t in good conscience send you home without getting to know two of my favorite villages in Umbria: Bevagna (the perfect town to visit if your calves are aching; it’s in the valley!) and nearby Montefalco (perhaps my favorite small town in Umbria. Art, architecture, food, wine, views, textiles…Montefalco is all that is wonderful about this region in one convenient little package.) Start in Bevagna, making sure not to miss the medieval workshops, and end your day in Montefalco, from where you will certainly want to watch the sun set over the Umbrian valley. I love L’Alchimista for dinner. This is your last day, and a bit of a wild card since you may have all the time in the world or you may have to make a dash to your next destination. Fill this last day/half-day/quarter-day/final two hours by choosing one thing off your Umbria bucket list that you didn’t get to earlier. Some suggestions: choose one of the Most Beautiful Villages in Umbria in which to say goodbye to this enchanting region; head to Deruta if you are interested in seeing this famed artisan majolica production; take a tour of the Perugina chocolate factory on the outskirts of Perugia and stock up on Baci for home; check out the Roman ruins of Carsulae near Narni; if you have the stamina for one more church, work in Lugnano in Teverina’s Santa Maria Assunta or the moving Madonna del Bagno near Casalina. You’ve come full circle–from your first Umbrian town to your last, with the best of the region along the way. May you bring back a little piece of Italy’s Green Heart in your own. This is not goodbye, but arrivederci! I am actually okay with death. By death I mean, of course, Death…not death. In fact, the absence of any conviction regarding the existence of an afterlife has freed me up to fully appreciate Mother Nature’s warped sense of humor, as she seeds the universe with our molecules to produce the next generation of stars and aardvarks, sequoias and spores, saints and Republicans. On the other hand, becoming a parent has made death all the more terrorizing. Though I have always admired Ayelet Waldman’s sentiments, they also somewhat perplex me. If I imagine the film of my life, my husband’s death would be followed a period of muted colors which would, over time, return to their former brilliance. The death of one of my children would mark the place where the film suddenly becomes black and white, and there would never be color again. But the abstract concept of Death doesn’t freak me out. I don’t get the heebies at the cemetary, have any particular aversion to blood and gore, and the few times I have seen bodies have been struck more with a clinical fascination than a sense of horror. So when I headed to the Valnerina to see the mummies in the 12th century church of Santo Stefano–now the crypt of the 15th century church built on top of the original–that I had been hearing about for years, it was with the lighthearted mood of adventure (and playing hooky from the office). The tiny village of Ferentillo tucked into a crag between two looming peaks. This warm and fuzzy inscription welcomes all visitors to the museum. e pensa pur che ciò sarà ben presto. and you will be what I am. and consider also that it will be quite soon. When the cheerful young guide suddenly popped out from around the corner to sell me our tickets and take us through the crypt, she pretty much scared the bejeezus out of me. My nine year old son was, by this time, trembling like a Labrador puppy at the prospect of 1) seeing mummies and 2) seeing his otherwise unflappable mother visibly rattled, so we stepped inside. This process of mummification only takes about a year. There are two mummified birds on display, the result of more recent test runs by skeptical locals. The crypt-turned-museum is quite small and there are probably no more than twenty mummies on display, so the visit didn’t take long. Our guide explained how the combination of a microfungus and mineral salts in the soil and a unique air flow (there are openings along one wall where the cold storm air was gusting in) resulted in the natural mummification of many of the bodies buried here over the centuries. The mummified remains were discovered at the beginning of the 19th century, when a Napoleanic edict ordered the emptying of crypts and the trasfer of remains to cemetaries outside of the town walls. This being the Valnerina—an impenetrable area which held out against Christianity, Napoleon, and a united Italy long after the rest of Umbria—they continued to inter their dead here until 1871, when the last coffin was placed in the crypt (it’s still on display, though the surviving relatives have forbidden its opening). Some of the most intact of these mummified corpses are displayed behind glass, and the guide’s chirpy commentary—with gruesome backstories of torture and hangings (You can still see where his neck is broken! ), disease and plague (Notice how the sores are still visible on her skin! ), human tragedy (The baby looks as if he is merely sleeping! ), and grim details (If you step closely enough you can see the whiskers, teeth, eyeballs, and hair! )—was both surreal and compelling in a Tim Burton-esque sort of way. Add to this the muffled sound of thunder and flashes of lightening that periodically made the lights flicker, and you pretty much had the making of a nine-year-old boy’s perfect excursion. There are also neatly shelved skulls and bones on display in the dimly lit crypt. Is it macabre? Sure, but in a fascinating way. Unlike the Egyptian mummies we are so used to viewing, these are recent enough that the details surrounding their lives and deaths resonate more and make them more human and less monstrous curiosities. Their stories are told matter-of-factly, yet with great decorum and respect. Death is, after all, a part of life. That said, is it a little spooky? You bet. As a rule, I am not a big fan of books about Italy written by non-Italians. They are often condescending, superficial, and/or naive. That said, I loved Dianne Hales’ entertaining and informative La Bella Lingua: My Love Affair with Italian, the World’s Most Enchanting Language and was so honored when she asked me to contribute a blog post about my experience raising my children bilingually in Italy. You can read my post (and see a very cute picture of my little diavoli) here! In a perfect world, I would come back to this blog post every once in awhile to dust it off and add new fonts of information for planning a trip to Umbria. As we know, this is not a perfect world. Your mileage may vary. Well, the world isn’t perfect…but I did manage to get back here to update this post in under two years, which is a pretty good turn around time for me. I have two resource suggestions in which I personally have my paws, both of which have come into being after this post was written and both of which you can read all about here. Umbria Slow: Food, Culture, & Travel: an iPhone app with pretty much all the information contained in this blog, but boiled down to fit on your mobile device screen. My co-author is Alex Leviton of Lonely Planet fame, so it’s a little bit country, a little bit rock and roll…and all Umbria. Umbria on the Blog: This is where I am more actively blogging about Umbria now, because they pay me. What I get when I blog here is personal satisfaction and backed up ironing. I am very cautious about overusing printed guidebooks. While it’s handy to toss one in your carry-all when you travel for some one-stop referencing of maps and sites, art and history, local customs and practical information, there is much more complete and timely information available online. Many guidebook authors are not based in the countries they are covering, and much of the information (especially regarding lodging, restaurants, and hours of museums and monuments) goes quickly out of date. That said, I adore the Umbria guide published by Cadogan Guides. Adore. I have never met prolific travel writers Dana Facaros and Michael Pauls, but when I do I will either take them to dinner or marry them. They did live in Umbria for a few years, and their knowledge of and affection for this region permeates every page of their instructive, engaging, and light-hearted writing. This is the guide you want. The Umbria guide that puts the others to shame. For walks and hikes in the region, I mention a few possibilities here. For driving itineraries, Sunflower Book’s Umbria and the Marche by Georg Henke or Frommer’s 25 Great Drives in Tuscany and Umbria can do in a pinch (though I think you can get the same itineraries and maps with a little online diligence). For the foodies out there, Christine Smallwood’s An Appetite for Umbria: The People, the Places, the Food is a feast for the eyes, soul, and palate. Restaurant recs, luscious pictures, mouthwatering recipes. A keepsake. Unfortunately, the latest edition from 2006 has begun to show its age. Rather than as a guide in the strict sense, I suggest using this as more of a coffee table book to remember your visit to Umbria (and to duplicate the cuisine at home, as there are recipes!). I like the official regional website primarily for the downloadable maps and proposed itineraries. For some information on the regional cuisine, you can take a look here. A jaw-droppingly complete and engaging website for biking in Umbria is here. For planning a winery visit, La Strada del Sagrantino association offers an informative and well organized website. Wineries, oil mills, local artisans, and foodie events are all here. The Park Service can’t manage to provide decent trail markers half the time, but their website is surprisingly chock full of information about the regional parks. I love to get off the beaten path a bit, and a great place to start is with the Most Beautiful Villages of Italy site. For biking around Umbria, check out Bike in Umbria. Walkers and hikers can find information instead at Via di Francesco. One of my favorite sites for pure quirky pleasure is the Strada dell’Olio DOP Umbria. Great information for visiting oil mills in Umbria, but also check out their Unusual Sites, Local Personalities, and Wanderings pages. I can’t speak highly enough of Bill Thayer’s Website. Bill is a lovely curmudgeon (and I say that with much affection…I wouldn’t have it any other way) who has walked about 2,000 km all over Umbria, taking detailed photos and notes. His site isn’t flashy and his delivery can be dry, but there is simply no more complete online resource for Umbria than his juggernaut of a website. Life…Italian Style – American chef and Umbrian resident Jennifer tells of life and food in this region. Discovering Umbria – Alessandra organizes wine and food holidays and customized tours in Umbria…and writes a wonderful Umbria blog. 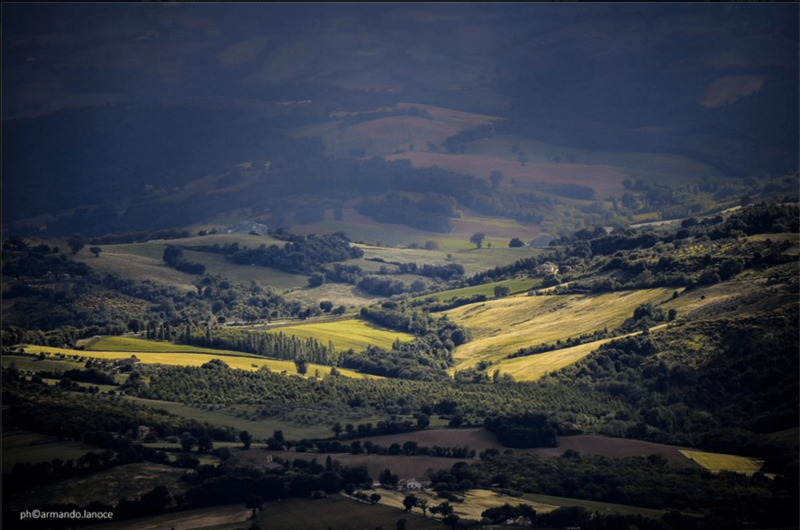 Villa in Umbria – A lovely blog with some gorgeous photography. For foodies, you can’t go wrong with local cooking class instructor. Again, Jennifer’s cooking (with a little Life in Umbria thrown in) blog at Life…Italian Style, Deborah’s Italian Food Forever and Simona’s Sagra in Casa are allo winners. I have been, over the years, either a lurker or an active participant in every major travel forum out there. Only one, however, have I stayed true to over the years for the pure quality and scope of information, friendly vibe, and sense of community. Slowtalk (the forum for the Slow Travel website) is where it’s at. I have never seen a question go unanswered there (use the search function before posting, though…chances are your query has already been discussed!). Umbria still uses the anacronistic posters plastered along roadsides and on billboards, which is a good way to get an overview of what’s going on while you are in the region (many have the website address for the event at the bottom, for more information). One of the best resources for current festivals and events is the monthly VivaPerugia magazine, which you can buy at newspaper stands for €.80 They list cultural, music, and art events, restaurants, food festivals, courses, children’s activities, and some practical information (the location of pharmacies, gas stations, and a train schedule). The magazine is in Italian, but the listings are easy to decipher even if you don’t speak the language. Each town also has a local tourist office, which—at best—provides up-to-date event information, maps and brochures for local sights, and logistical travel information. At worst, it provides a life lesson in surly government employees. It can go either way.